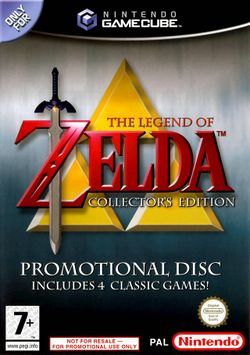 The Legend of Zelda: Collector's Edition (known as The Legend Of Zelda Collection in Japan) is a compilation of certain Zelda games made available in some Nintendo GameCube bundles. It was also given to some players who registered their games and hardware on Nintendo's site or subscribed to Nintendo Power. The Legend of Zelda: A Link to the Past was conspicuously absent since it had recently had a Game Boy Advance port (The Legend of Zelda and Zelda II: The Adventure of Link later got this treatment as well). The demo of this game lets you choose from one of three special saved games (each of the names is a description of the type of gameplay that the location of the saved game focuses on): "Dungeon" (inside Dragon Roost Island), "Stealth" (inside the Forsaken Fortress), and "Island" (at Windfall Island). Surprisingly, the "demo" does not feature any real type of hindrance besides what is already governed by the game (although you cannot save the game or change or view the options). For example, the saved game titled "Dungeon" puts you inside the Dragon Roost Island dungeon, however you can leave at any time and explore the island. Unfortunately, after you arrive at the island (as the developers did and then saved the game for the demo) the Red Lion requires that you complete the dungeon and retrieve Din's Pearl before being able to sail again. You can better understand this if you play from the "Island" saved game and then sail over to Dragon Roost Island. Note that each of the saved games starts with different items, however the Hero's Shield, Spoils Bag, and Telescope are present in all of them. The "Dungeon" saved game starts with the Delivery Bag, an Empty Bottle, the Hero's Sword, Pirate's Charm, Sail, zero Treasure Charts, Wind Waker, and one Red Chu Jelly and one Joy Pendant in the Spoils Bag. "Stealth" begins with just a single Joy Pendant in the Spoils Bag, and "Island" has nothing in the Spoils Bag, but begins with the Hero's Sword, Pirate's Charm, Sail, and zero Treasure Charts. This page was last edited on 4 April 2016, at 17:43.